If you are a coffee lover, you have probably used a french press at least a few times and know that you can make some great coffee with them. There are only a few small downsides: it can be difficult to clean them and it can be hard to get out all of the coffee without getting any grounds in that last cup. These are small things and aren’t going to stop me from using my french press anytime soon, but they are enough to make me keep my eyes open for other brewing options. 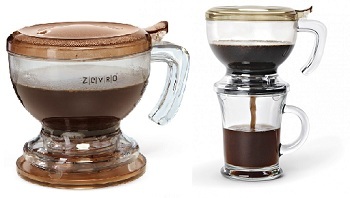 The Incred-a-brew Direct Immersion Coffee Maker from Zevro is just one of these choices – and it looks like a good one. I’ve used their Simpliss-a-Tea tea maker, which features the same design, many times with great results. The Incred-a-brew Direct Immersion Coffee Maker lets you steep your ground coffee in hot water (much like a french press), but instead of pressing the grounds through the coffee and then pouring from the top, you can actually dispense the coffee directly into your cup through the bottom of the coffee maker. The gadget has a very cool release valve on the top that that dispenses the coffee directly into a cup when you place it on top of one – and, more importantly, it instantly stops the flow when you lift the coffee maker. It only makes one (large) cup of coffee at a time, so it is great when you want a single serving and it doesn’t take quite as much babysitting as a pour-over filter set up.